Ugh, really? 7 months already? Every month that goes by, seems to of been the quickest one yet. 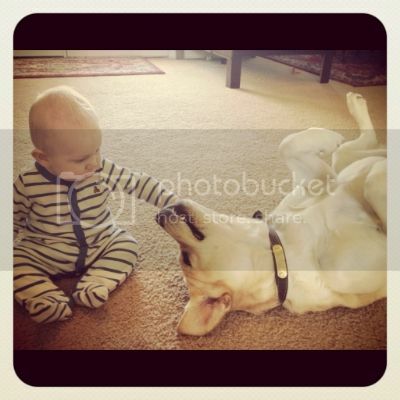 With Hunter, I looked forward to him growing up and seeing the little boy he was growing into, it never made me sad. Hudson is a whole different story, I tear up, I fight him not being a baby anymore. I'm sure it's because I knew that Hunter would not be the last and Hudson may be. He is doing awesome, though! 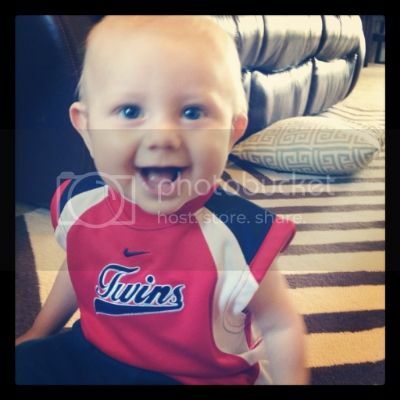 Hudson has got to be one of the sweetest and nicest babies. He's so full of joy and only fusses when hungry or tired. He's living such a peaceful little life since I've gotten to know him better. His cues have gotten so easy to read, I feel like I know just what he needs and when he needs it. 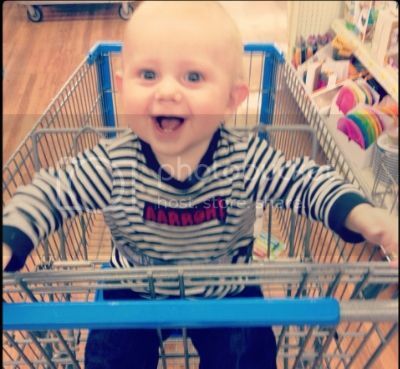 Eating: This baby loves his food! He's drinking about five 6oz bottles and eats solids twice a day. It doesn't matter if it's peas or bananas or green beans or apples, he gobbles it all right up. I've been much more relaxed with him than I was with Hunter in introducing him to new foods. He's had pieces of oranges, macaroni and cheese, little pieces of chicken, etc. this month. Sleep: Hudson has become a dream baby as far as sleeping goes. (I never thought I'd be saying that about him!) He goes to bed between 7-7:30pm and sleeps straight through until 7-7:30am. No complaints here! He naps a lot. He takes three naps a day and they range from 1-3 hours. Usually at least one of the naps is 2+ hours. He's only awake for about 2 hours between naps, so doing anything with him, besides quick errands is a bit difficult still. That's okay though, not much to do here in Altus anyways! 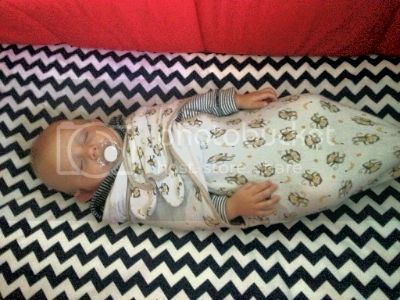 Oh yeah, and he still will not sleep anywhere but in his crib and swaddled for the most part. He knows what he likes. 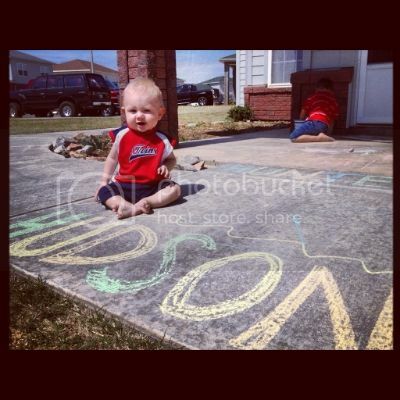 Other: Hudson is wearing mostly 6 months clothes still and size 3 diapers. He's such a skinny little peanut! He sits up all the time unassisted like a pro. He likes to sit by Hunter while he's playing with toys and even joins in when playing ninja turtles. He's been responding to "kissy lips" and leans in for a big open mouth kiss. I'm pretty sure he's starting to cut two of his top teeth, but they haven't poked through quite yet. He also LOVES his doggy. Henry and him are pretty much best buds. Hudson's eyes light up when he sees Henry. 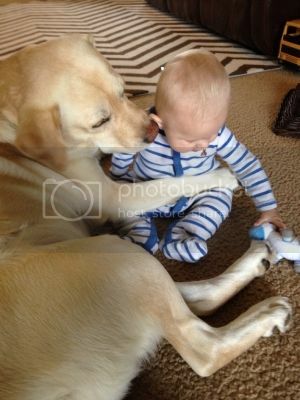 And Henry is pretty quick to lay down next to Hudson and give him kisses. 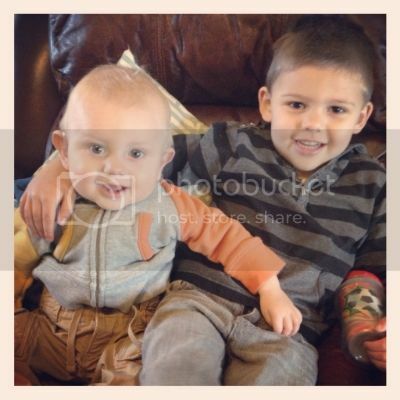 Hunter and Hudson have also become much better buddies lately. I think now that Hudson can sit up and grab toys, Hunter has an easier time "playing" with Hudson.